Wow, that's a serious sounding KAL title, huh? 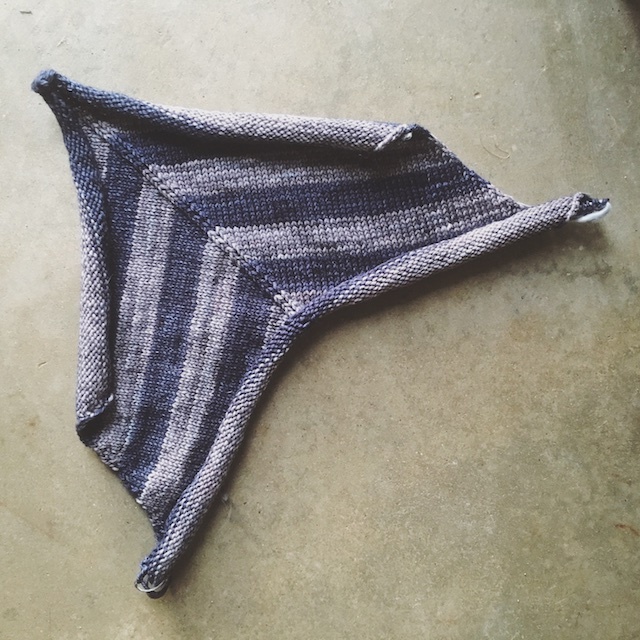 It seems to need an intense Y2K reference thrown in there, like: Holla Knits Titanium Knit-along 2016-2.0. That has the right wave-of-the -future vibe to it. 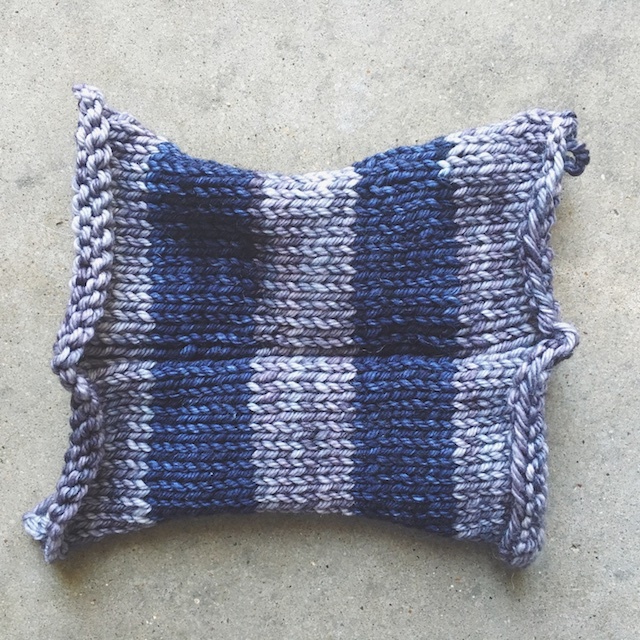 No, it's not a doomsday cult, just a knit-along. It's one of my favorite group KALs to take part in. Holla Knits puts out so many design I want to make that I'm always having to narrow down from twenty things I want to knit, to one or two. This year it's the Thing to Wear Cardigan, by Allyson Dykhuizen. (Did I just type that correctly on the first try?! Nope.) It's a long, kimono-type cardigan that has so many elements I love. Theres a very graphic striped, chevron detail on the back, which I've already completed. It was a fun portion to start with. Then there's the kimono sleeves and long, flared body. Starting with the striping was a fun way to begin a pattern. 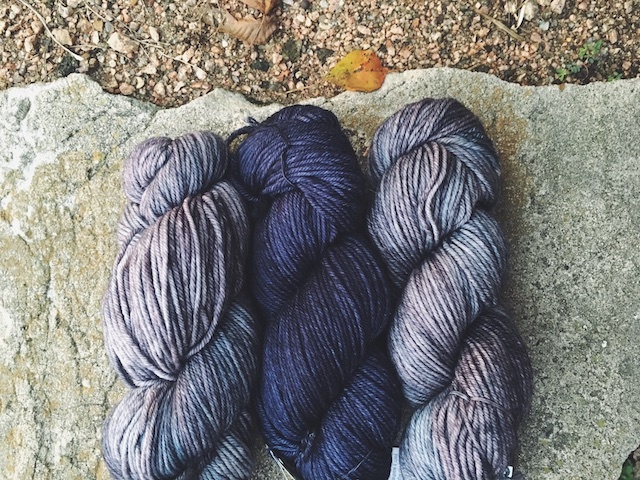 I loved watching these two colors of Malabrigo Rios (Paris Night and Plomo) work up together! Color is so much a part of my enjoyment of knitting. I've never used Rios, or any Malabrigo yarn, before. I feel like the last knitter on Earth to try them. So, I'm finally able to experience what I've been hearing about all these years and it is living up to the hype. I'm anxious to get on to the rest of the body because this looks like it will be interesting construction. I was on the fence about whether or not to knit the flared kimono sleeves, like in the sample, or the modified tapered sleeves that Allyson has on the blog. I think I've almost decided to go all the way with the visual interest of this cardigan and knit them wide. I mean, I'm already using a color combo, with high visual impact (at least to me) and the whole knit has a unique shape. I may as well round it out with dramatic sleeves for a dramatic sounding Knit-along 2000 cardigan, right? What do you guys think- wide sleeves or tapered? I've got to decide soon. Now I'm hearing the tv trailer, voice-over guy saying, "In a world where most sleeves are fitted... one knitter must make a choice..."